Does your first year wedding anniversary happen to fall in early May? With the great outdoor-party weather around that time, we suggest a fun and festive Cinco de Mayo-inspired party! With all the fanfare and exuberance that Cinco De Mayo brings, it is no wonder that this festive May holiday brings forth the perfect setting for an exciting wedding anniversary—fiesta-style! Mark this special occasion in a fun and creative way with all the vibrant colors, sounds, and flavors of Mexico—from the table decorations and food, to the party fare, and beyond. A beautiful pouch nestled amidst an entire rainbow of colors sets a fiesta scene that almost shouts, “¡Viva Mexico!” in true Cinco de Mayo fashion. What makes this celebration such a visual delight is the array of vibrant hues you can bring in. Create a palette of pink, blue, red, orange, purple, green, and beyond. Spice it up like chili with touches of red and fuchsia; and infuse it with yellow for the warmth of the summer sun. Even mismatched colors can add an element of surprise—so don’t be afraid to experiment here. The overall effect is sure to get the party bursting with energy! Wide-brimmed sombreros display multi-colored favor boxes, while also forming a table-long centerpiece with piñata-inspired crepe paper balls. Play up the whimsical mood of the table with oversized sombreros! 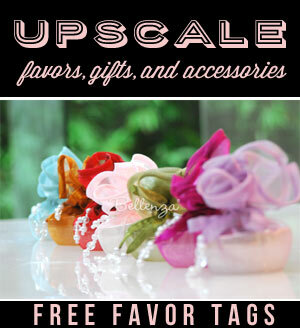 Their wide brims are perfect for displaying favor boxes wrapped in different shades of shimmering fabric. Put one sombrero at each end of the table, and arrange piñata-inspired crepe paper balls between them—creating a table-long centerpiece. 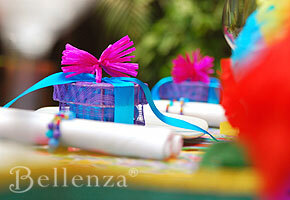 Scatter multi-colored paper streamers amidst the table display to complete the fiesta look. No sombreros at hand? You can also give a fun twist to the table by filling oversized margarita glasses with festive blooms, such as bright yellow carnations, orange dahlias, or a colorful array of gerbera daisies. Or if you prefer not to use flowers, try filling up the glasses with vari-colored fruits for an equally striking effect. Simple white plates and table napkins highlight the place settings amidst all the bold colors. Atop each plate sits a heart-shaped box decked out in purple, aqua, and fuchsia. Make each place setting a little fiesta of its own! Again, color is key here. A simple white plate serves as an ideal backdrop for other festive components. In our setting, a purple box holds a guest favor, and is finished with an aqua satin ribbon and a tufted raffia bow in fuchsia. Alongside is a white table napkin held with a pretty beaded bracelet. A fun alternative to the bracelet? Little red chilis strung together to serve as playful napkin rings! Mexican food and drinks lend themselves perfectly to party fare—with colors, flavors, and aromas that immediately say fiesta! With a fiesta as inspiration, you can definitely make food and beverages part of this party’s décor. So, for the food you serve up and the drinks you offer, think delicious, attractive, and festive! For example, plan an interactive food scene with a do-it-yourself taco or fajita bar, and a sizzling hot grill in the background. Just imagine the enticing aroma of char-grilled steak, chicken, and shrimp filling the air. As an added treat for guests, serve up some freshly made tamales. For the condiments, use simple white containers to contrast with fresh avocado dip, must-have black beans, tempting red and green salsas, cilantro, jalapeños, and brown Mexican rice. As for the drinks, include classic margaritas, but offer something new and unusual—tequila-infused Mexican cocktails perhaps, with exotic flavors such as guava. For non-alcoholic beverages, serve up some colorful Mexican soft drinks from Jarritos® and present them in sleek, tall iced glasses. 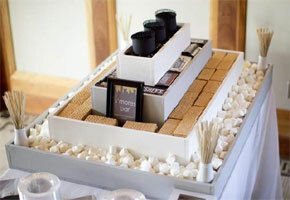 Offer something sweet and memorable to guests. Consider desserts such as tres leches, Mexican fried ice cream, and churros. As delicious accompaniments, you may also want to provide Mexican hot chocolate prepared with a pinch of cayenne pepper and coffee infused with some exotic liqueur such as Kahlua®. To give as party favors, prepare scrumptious Mexican goodies—whether home-baked or store-bought. Pack them in heart-shaped woven boxes, wrapped in organza fabric for a stylishly festive presentation. Send your guests off gasping in delight from this Cinco de Mayo anniversary party with scrumptious baked goodies—Mexican ones, of course. Consider giving buttery, powdered Mexican wedding cookies, mantecados, marranitos (Mexican pig-shaped cookies), polvorones, or mini churros. Or you can prepare Mexican pan dulce, literally “sweet bread.” Guests can enjoy these at home as a wonderful afternoon snack or midnight treat with coffee or tea. Now here’s a party they will never forget! Previous From the Tropics to Your Tabletop: A Coconut Tree Centerpiece! I just love this idea! I’m planning a party for my sister and this will be our theme. 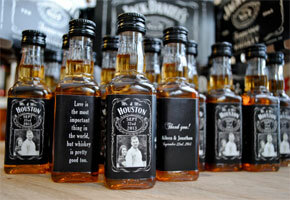 Do you have any ideas for what kind of favors to give kids? They are going to be several children too at the party. As kiddie favors, you can give out Mexican candies! They are available in any local Mexican grocery. Or why not try miniature maracas. Wrap them in colorful paper. You can also do something extra special by having a pinata at the party. Kids will love it, but it’s sure to be a hit with adults! Hello, I was looking at the picture of the heart shaped boxes. What is the ribbon that was used on the pink box? Is it a yellow ribbon? It is actually a fabric that has been made to form a flower. You can achieve the same effect with colorful gift wrapping paper as well! How did you make the pom poms in all the vibrant colors. LOVE YOUR IDEAS HAVING A CULTURE DAY ON SATURDAY 31ST JULY 2010. WILL BE USING YOUR IDEAS. You are so sweet, Bird! Thanks so much for the FB share of this post.